Please carefully read our general information on the online application before applying for a program. 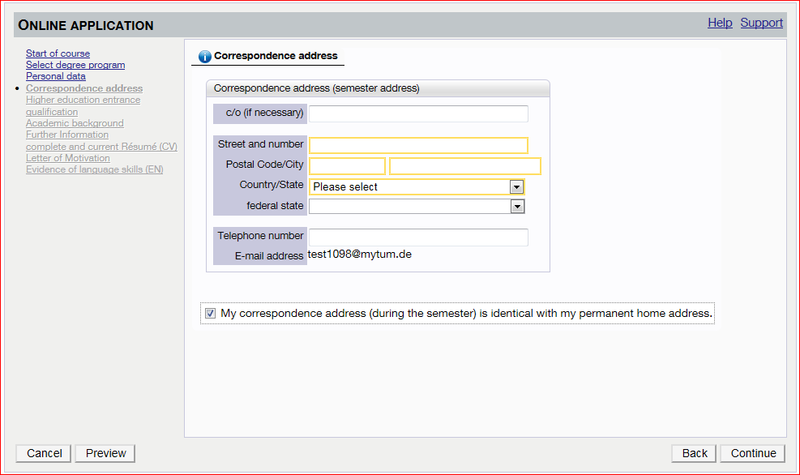 You cannot edit personal data after creating a TUMonline account, and it is usually not possible to exchange files you have uploaded during the online application. So please check the information you provide carefully in order to avoid problems during your application at TUM. Please select the semester you would like to apply for. Please note that you can only apply for courses that are offered in the respective semester. Select master’s program under Type of Studies. 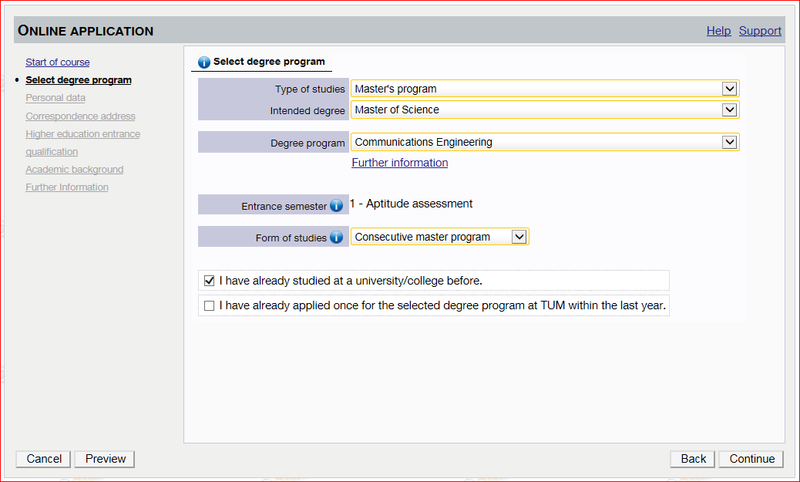 Under Intended degree you need to select the type of degree corresponding to the program you are applying for – i.e. Master of Science, Master of Education, etc. Degree program lets you choose the specific program you wish to apply for. Entrance semester is always 1 if you apply for your first master’s program. 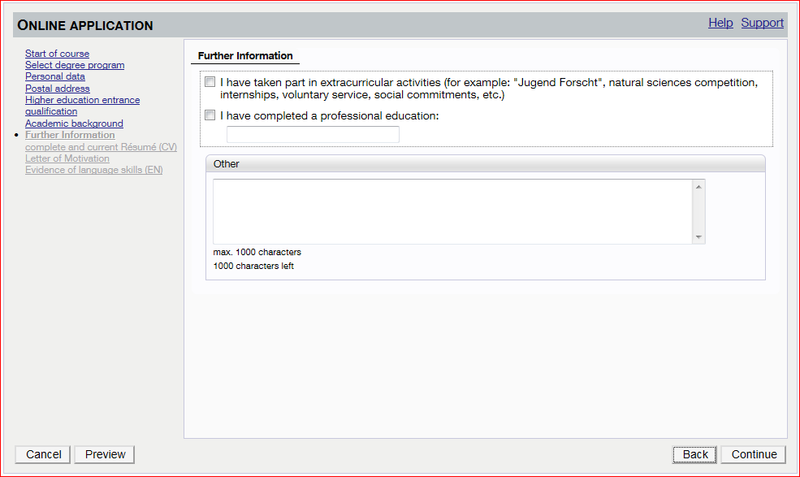 If your desired program requires an aptitude assessment, it will be displayed automatically. 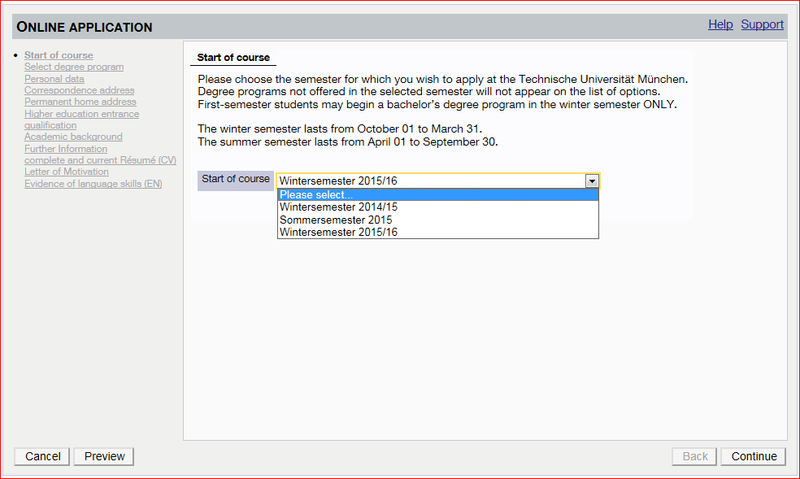 Please note that you can only select degree courses which allow an application for the semester you have chosen. Under Form of studies, select Consecutive master program. This is where you can check the personal data you have entered upon registration. If you discover an error, please correct it in writing on your printed application (step 11) – you cannot change your personal data at this point. If there is an error in your personal data, please enter corrections by hand on the printed application form. The Registrar's Office will enter your corrections after receiving your application documents. Here you will be asked to give the address you currently receive your mail at. If your current address is the same as your home address, indicate this by marking the field below the input mask. This refers to your secondary school qualifications. 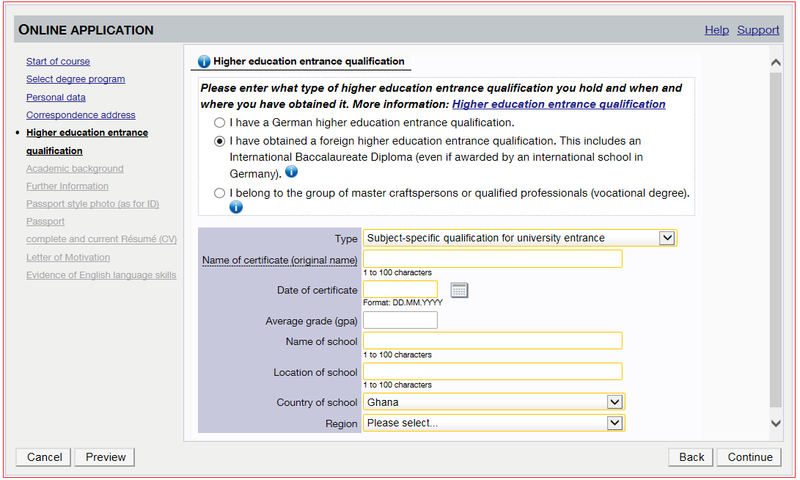 If you are an international student, please select I have obtained a foreign higher education entrance qualification. 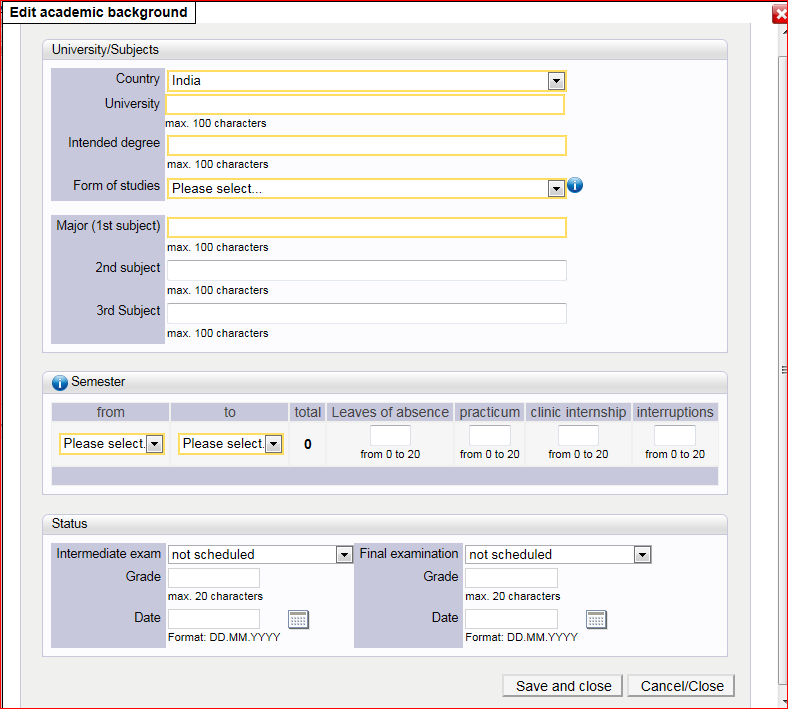 Under Type, select subject-specific qualification for university entrance. 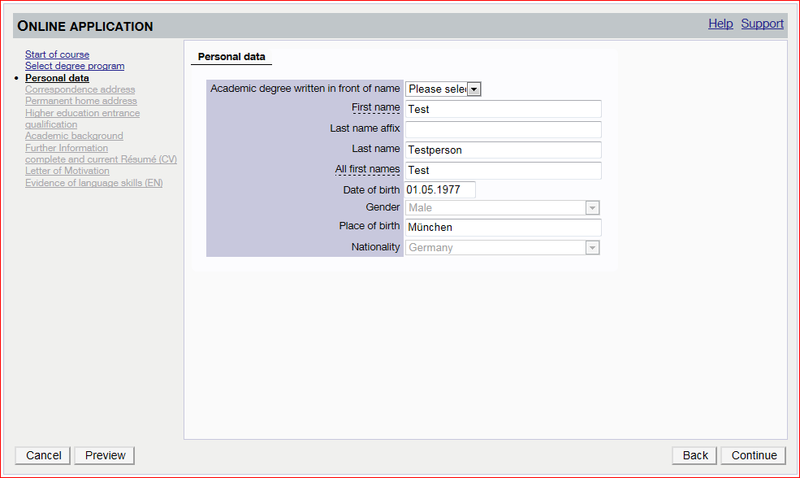 Then fill in the remaining fields based on the official document relating to your entrance qualification – e.g. high school diploma, A-levels etc. If you are unable to fill in the fields for specific grades, you can just leave them blank. As soon as your documents arrive at TUM, the information will be checked and updated if necessary. Please note that I belong to the group of master craftspersons or qualified professionals (vocational degree) does not refer to work experience or employment. This is a specific certificate verifying your training for a specific job. Visit tum.de to learn more about vocational degrees. This form asks you to provide information about your previous studies – in most cases this refers to a bachelor’s degree. If you hold more than one degree, you must fill out a mask for each degree. A new mask will allow you to Add a degree program after you select save. Under Intended degree, please state the type of degree you hold or are to be awarded upon graduation (e.g. Bachelor of Science, Bachelor of Arts etc.). Under Form of studies select first degree. 1st subject under Major refers to the name of the respective degree course. You can leave 2nd and 3rd subject empty if they do not apply to you. Under Semester, enter the dates in which you completed this degree program, i.e. the semester/year in which you began under from and the semester/year in which you completed your studies under to. Leave the other fields (Leaves of absence, practicum, clinic internship, interruptions) empty. Under Status, fill out the section Final examination. Here, select passed on the whole. Under Grade, enter your final grade point average as indicated on your degree transcript. Under Date, enter the date of issue of your transcript or degree. 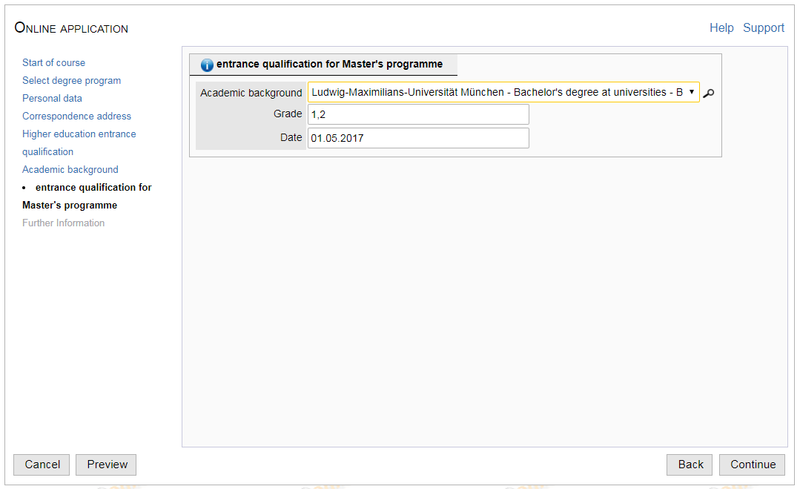 In this step, please specify your entrance qualification for a master’s degree program, that is, an academic degree qualifying you to study at the master’s level, generally, a bachelor's degree. If, in the previous step, you named only one academic degree, this will automatically be considered your entrance qualification. If, however, you named more than one academic degree in the previous step, please indicate which of these is to be considered your entrance qualification for this application. If you have not yet completed the academic degree, e.g. the bachelor’s, that will qualify you for master’s studies, please indicate the expected date on which the degree will be awarded, the number of ECTS credits you have earned to date, and, if known, the provisional overall grade for the degree program. 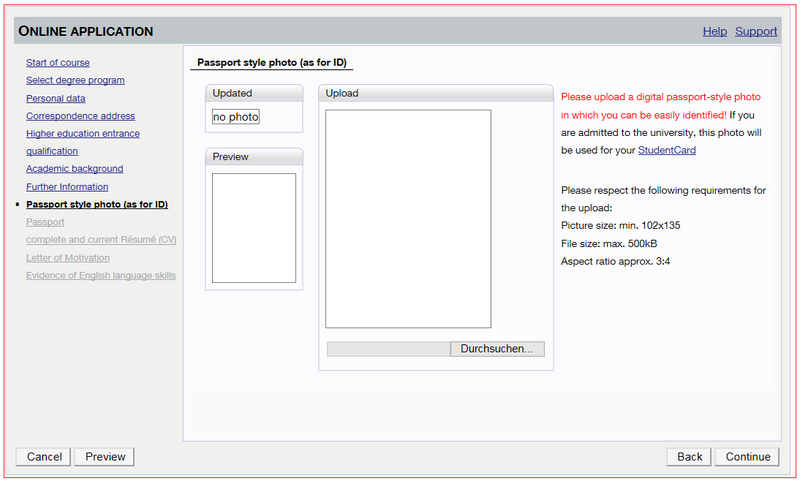 Please upload a digital passport-style photo in which you can be easily identified! If you are admitted to the university, this photo will be used for your StudentCard. Please complete in the following forms (e.g. by uploading your CV, Letter of Motivation, etc. ), which vary according to your desired degree program. 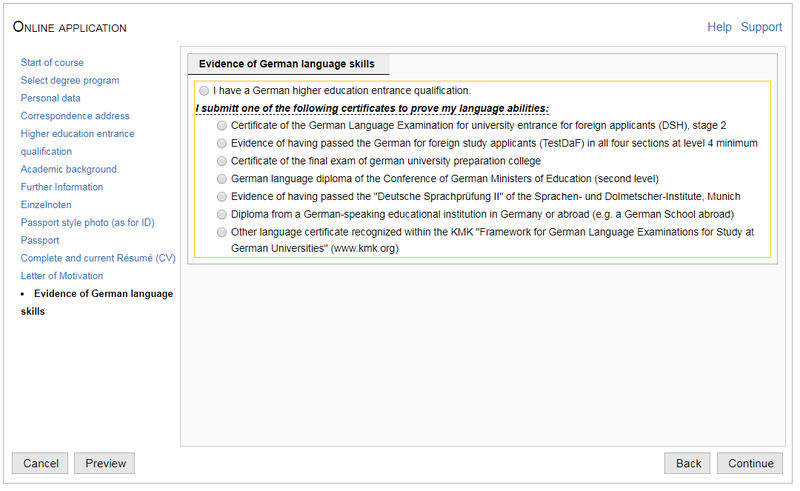 Once you have filled out the final screen Evidence of language skills, you have completed the online application. By clicking the Continue button at the bottom right-hand corner, your application is saved. You still need to submit it. This overview allows you to check the data you have given. To make changes, go back through the application using the back button. Certain entries, such as your personal data and the chosen degree program, cannot be changed at this point. Please confirm that the information given is correct by checking the box. You can then send your online application. If you cancel the process at this point, your entries are saved and you can submit the online application at a later time. You need to submit your online application for TUM to consider it. 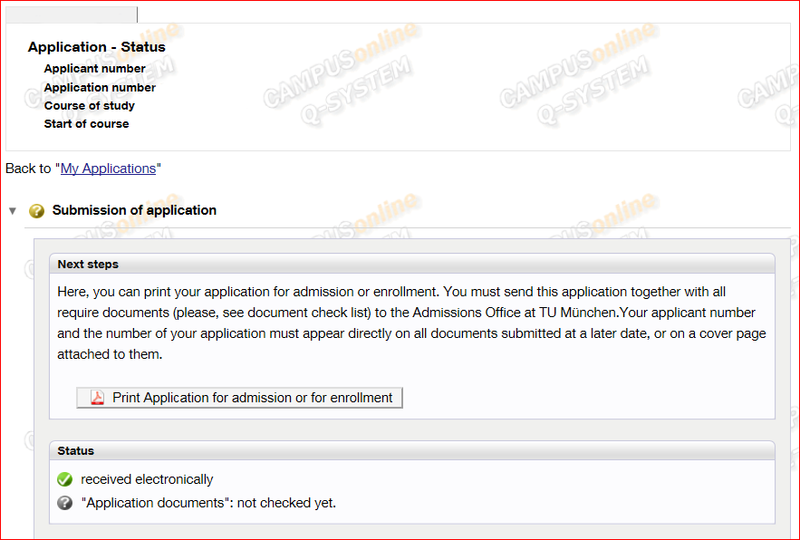 By sending your online application you have completed the first step towards studying at TUM. You can view the status of your application in your TUMonline account. Here you can also download and print your Application for admission or for enrollment. You need to download, print and sign this application, and send it to the address given in the application. This application form has to be submitted as hardcopy by mail – digital versions cannot be accepted. This is necessary for TUM to consider your application. The Registrar's Office will review your application documents after receipt of both your online and hardcopy submissions. Depending on the degree program and its admission procedures, your documents will be forwarded to the relevant school or department. Due to the high number of application this process takes some weeks. You can always check the status of your application in your TUMonline account. If you have any questions, our Service Desk and the TUM Hotline are happy to help.